My new "German felt & Leather" MacBook Pro case! Isn't it amazing? 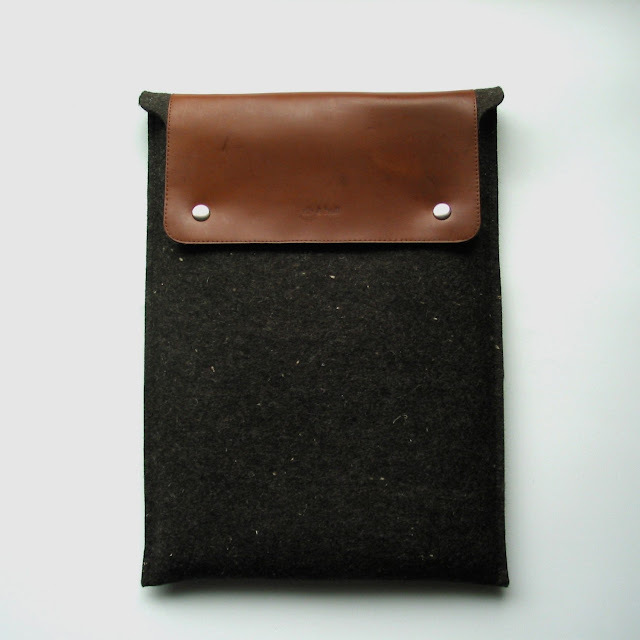 It's made with 1/8" thick, German felt (100% wool) & naturally dyed brown leather that will just get better with age. The flap has two snap closures that are fully lined and reinforced with leather (won't damage your laptop). I bought "Truffle Brown", but it's also available in red and "Anthracite Gray". And the best bit? It only cost me $10 more (including shipping) than the nasty neoprene rubbish that I came thisclose to buying at a certain fruity computer-y store. Rib and Hull also sell similar products for iPads, iPods, larger MacBook Pro's and Kindle readers. There is love in the house! Oooo it looks delicious and super stylish. I saw a fab grey felt cover on etsy a few weeks ago that I still have my eye on! Hello to every one, it's really a nice for me to pay a quick visit this web page, it contains useful Information.